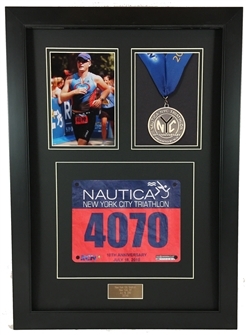 Frame and display your race photo, finisher medal and race bib just like a professional in minutes with our ready-made framing kits. 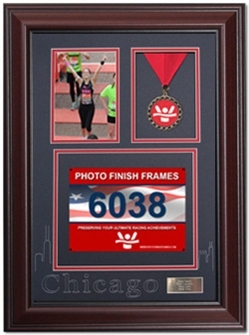 High-quality materials that will preserve your memories for a lifetime. Easy to follow instructions. Included diamond engraved brass or silver race informational placard. Makes a great gift. 100% Satisfaction Guarantee. We strongly believe in helping to protect the environment that we all enjoy swimming, cycling, running and racing in. Our frames are made out of the finest quality eco-friendly wood composite that is engineered to exhibit properties superior to traditional woods. It is a solid recycled material, with a very smooth, wrapped laminate finish that is extremely consistent, equal-to or better than most stained wood finishes. By choosing to use eco-friendly wood composite moldings, we are effectively keeping hundreds of mature trees standing.